I have some shutters and rain cutters that need repairs. Home is 25+ yrs old looking to replace gutters and siding. Team was very professional from quote through scheduling and getting the work done. Very fast, very professional. Doylestown, PA is no stranger to inclement weather such as winter storms, heavy rain, and hot, humid summers. Your home's exterior is the first thing to come in contact with these seasonal changes while keeping you and your family safe and dry, so it's no surprise that your siding and roofing system can take on damage. That's why Summit Roofing and Siding Contractors is here for you, your trusted roofing and siding company serving Doylestown and surrounding areas since 2009. We offer roof repair, roof replacement, siding installation, and gutter work throughout the Doylestown area. We are fully prepared to take on any residential or commercial project with fast, thorough service and lasting results. Do you need a replacement roof for a condominium or townhouse? We offer commercial roofing styles such as asphalt shingle roofing, EPDM/rubber roofing, modified bitumen, metal roofing, and PVC roofing systems. Even the best roofing system will run into trouble if you have faulty gutters or downspouts. There's nothing worse than dealing with the stress and hassle of gutters that frequently clog or overflow, not to mention the safety risk of climbing up on ladders to reach your roof. We offer gutter guards and complete gutter replacement throughout the Doylestown area. Our gutter options include both aluminum gutters and copper gutters, and we provide commercial gutter work as well as our residential services. Summit Roofing and Siding Contractors is the roofing company that you can rely on for all of your roof repair, roof installation, and siding replacement needs in Doylestown, PA and nearby. Call us or contact us online to schedule your free cost estimate and get started on your home upgrades today! Left Front View of the Siding Installation Job. Front Side View of the Siding Replacement job. 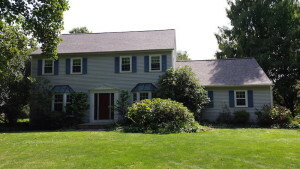 Coming Out On Top With A Doylestown Roof Replacement! Replacement of 40 year old aluminum siding required on two story colonial.